A Merrie Noyse can offer a selection of creative, cross-curricular activities for school pupils across the key stages linked to the national curriculum and based on many themes. With over 1000 years of music literally at our fingertips, contact us for expert advice on the correct music to accompany your historic performance. Whether you wish to learn a recorder or brush up on your brass, develop new skills or even deal with performance nerves. With over 30 years of instrumental and teaching experience, Barry & Sue can support your playing. Find out how music was used in Egyptian life, the instruments they used and how they used them. Explore the Ancient Egyptians through sound and dance. Find out how the Ancient Greeks developed music and musical instruments. Plenty of opportunity to join in and for creative music making spanning 2,000 years of history. How did people entertain and amuse themselves in the days of Ancient Rome? Discover the music and instruments of the day, find out how music was used in festivals, religious ceremonies and for fun. Find out about life in a medieval castle through music. Explore the dances and sounds of the day. 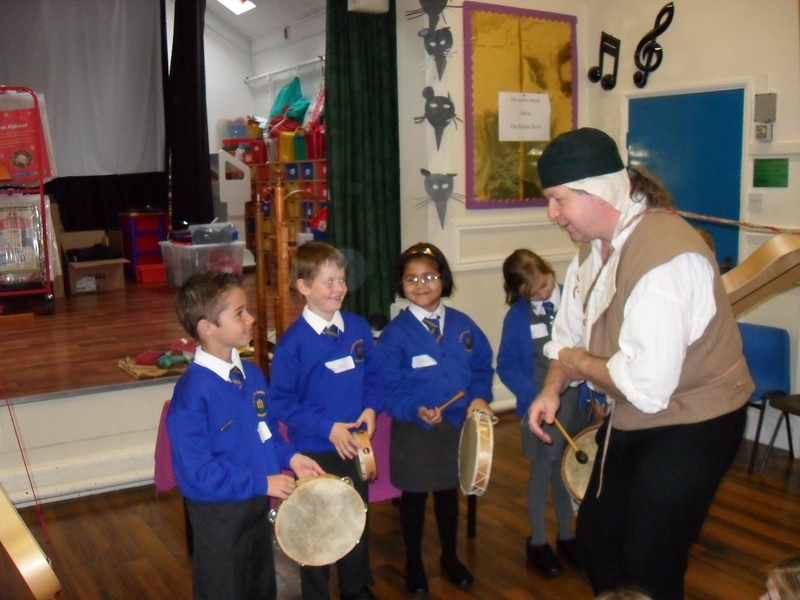 Explore music, song and dance from the turbulent Tudor times. Activities can be themed to suit your requirements based upon; The life of Henry VIII and his 6 Wives, The effects of exploration on Tudor England, A magical musical history tour of Europe during the 16th century, the reign of Elizabeth I and many more. The day is structured into demonstrations, performances and group participation in a tune, song and dance. Contact us to discuss your specific requirements and for assistance with pre- and post-visit activities. Magical Musical History Tour in 30 instruments! A fun, chronologically interactive session that explores the history of music through the development and use of instruments and notation from Ancient Times to Victorian England. A look at how musical instruments were made and played; how musical styles reflected changing fashions, the influences of war, religion and foreign exploration. Includes opportunities to try out some instruments, learn period songs and dances too. This session can draw upon local musical influences and famous people to reinforce prior learning and can focus on a particular historic period if required. You can book A Merrie Noyse (2 costumed musicians in school) for whole or half days sessions. All prices quoted are inclusive of milage. We have enhanced CRB/DBS status and Public Liability Insurance through the Musicians Union. Risk assessments for all activities can also be made available on request. Depending on the size of your year group or schools, we can work with anything from 10-120 pupils per day in a series of hands on workshops linked to your chosen theme. Why not add archery too with Pheon Archery – look at the page in our menu! With over 30 years of instrumental and teaching experience, Barry & Sue can support your playing. As a founder member of The Company of Sixty Rod has about the same number of years archery experience as we do musical ones. If you would like to learn the ancient art of the bow or even purchase a gift voucher for a friend or loved one – do get in touch! Bookable for your private party, wedding and for museums and historic house events. Contact us for further details.